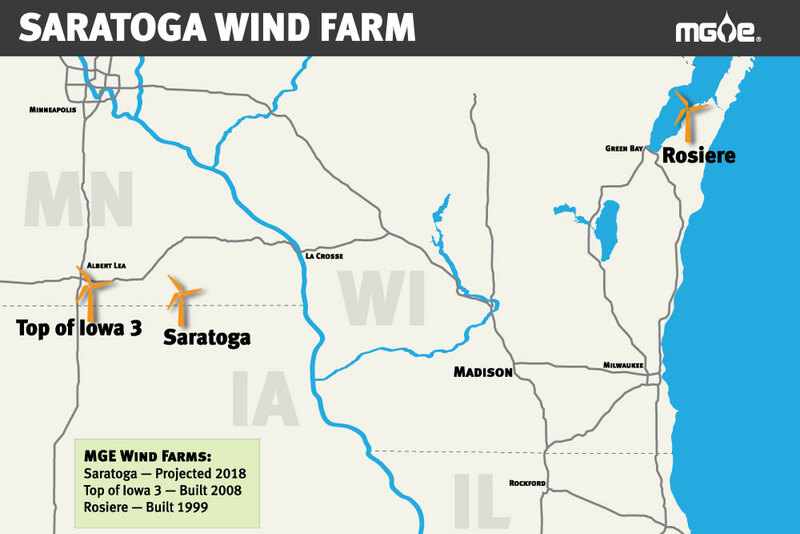 An article on Madison Gas & Electric's announcement to build, own, and operate a 66 megawatt wind farm in Saratoga, Iowa appeared in today's Wisconsin State Journal. Excerpt from the article below: "Tyler Huebner, executive director of the Madison renewable energy advocacy nonprofit RENEW Wisconsin, praised MGE's Saratoga project. 'We're happy to see MGE move ahead on their Energy 2030 framework and identify a large, renewable energy project,' he said." Madison Gas & Electric plans to build a wind farm in northeast Iowa that could generate up to 66 megawatts of electricity, enough to power about 47,000 homes. 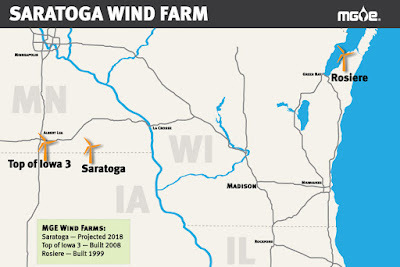 The Madison utility company said Tuesday the Saratoga wind farm in Howard County, Iowa, would consist of 33 turbines, each nearly 500 feet tall. That’s 100 feet taller than turbines at MGE’s Top of Iowa wind farm in Worth County, in north-central Iowa, installed in 2008. If regulators approve the proposal, it will be built next year and will begin operating by the end of 2018. The estimated cost is $107 million. The announcement came one week before Wolter is slated to retire as president and CEO, to be succeeded by Jeffrey Keebler, senior vice president of energy supply and planning, on March 1. Wolter will remain chairman of the boards of MGE and parent firm MGE Energy. Tyler Huebner, executive director of the Madison renewable energy advocacy nonprofit RENEW Wisconsin, praised MGE’s Saratoga project. “We’re happy to see MGE move ahead on their Energy 2030 framework and identify a large, renewable energy project,” he said. Huebner was not surprised about the Iowa location. “Right now, southwest Wisconsin is a little transmission-constrained. That is hurting the ability to develop wind power (in Wisconsin),” he said. In its Energy 2030 plan, released in November 2015, MGE said it plans to supply 25 percent of its electric sales from renewable resources by 2025 and 30 percent by 2030. MGE said it started searching for sites for a wind farm in summer 2015. It began negotiations for the northeast Iowa site in summer 2016 and obtained rights to the location last year from initial site developer RPM Access. If approved, it will be MGE’s largest wind farm. The utility also gets wind-generated power from five other farms in Wisconsin and Iowa. Tuesday’s announcement about the Saratoga project comes on the heels of a meeting held Monday night by RePower Madison, a citizen group formed in 2014 to oppose MGE’s rate increase plans. About 100 people attended the session at the Madison Central Library at which RePower Madison encouraged residents to send postcards to the utility calling for MGE to commit to 100 percent renewable energy. RePower program manager Mitch Brey said the timing of MGE’s Saratoga announcement could be more than coincidental, though the project has been in the works for a while. “We hope this will be the first of many clean energy projects for MGE’s incoming CEO, Jeffrey Keebler, and that he will embrace a goal of 100 percent renewable energy as he takes on his new leadership role,” Brey said. The MGE proposal is the latest in a series of wind generation projects announced in the past year. Alliant Energy, Madison, will build at least 500 megawatts in Iowa by 2020 and Dairyland Power Cooperative, La Crosse, said it will buy power from a wind farm under construction near Platteville and another, already operating, in north-central Iowa.